First of all, let’s clarify what a switch is. 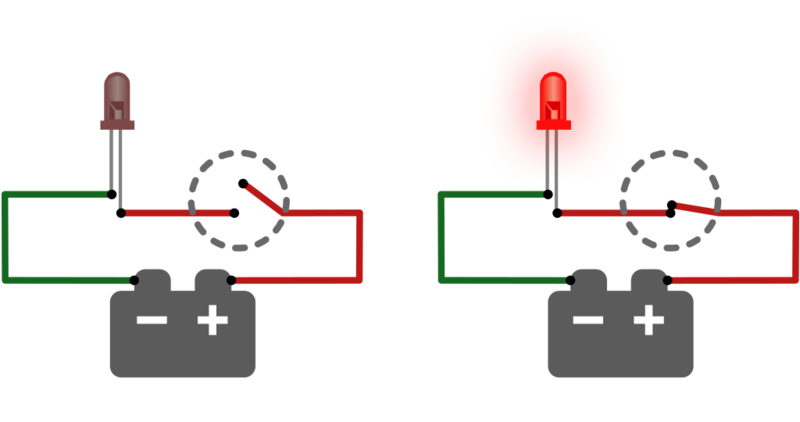 The switch, simply put, allows or blocks the flow of electrical current in a circuit. It cannot get any simpler than that. Either the wires touch, the current flows and the light lits up or they don’t, the current does not flow and the light turns off. Now, instead of powering a light like in the example above, we can replace the LED with a device that will detect if the circuit is open or closed. One such device is called a « keyboard emulator » (aka keyboard encoder). Because of its simplicity, it might just be the best device to get you started in physical computing. Magnetic switch (aka reed switch): This is a switch activated by a magnet such as those installed on windows and doors in a home security system. What’s cool about them is that you can hide the magnet in any object. When that object is near the magnetic switch, the input gets triggered. Motion sensor switch: Also standard in a home security setup. It will let you know when someone enters a specific space. Mat switch: Often designed for heavy machinery operator, this switch activates when someone steps on it. Think: Dance Dance Revolution. 8-position joystick: Many joystick are actually made up of 8 switches. There is one for top, right, bottom and left and one for each intermediate positions. You can hook up such a joystick to 8 inputs on the keyboard emulator. 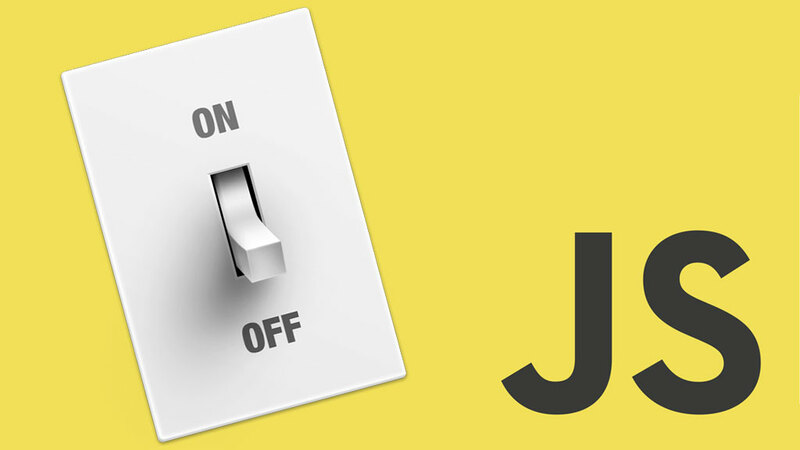 Tilt switch: A switch that activates when in a certain position and deactivates when tilted to a different position. You can even build your own switch. For instance, you could create a metallic wind chime where multiple circuits runs through the chimes. When the chimes touch, the inputs are triggered. In this scenario, TangibleKeyboard.activeKeys contains an array of all the currently active inputs. You could then use activeKeys.indexOf() to check if a specific input is active or not. Follow this link to download the library (also available on GitHub). The full API documentation is also at your disposal. As you can see, using switches with a keyboard emulator is simple and provides many ways to sense the world around you. It’s an easy way to enter the world of physical computing. The switch in the header image is a creation of Designer Board (link down) and is used in accordance with the usage terms. Great article and JS library, thanks for sharing. I’ve successfully installed a detect switch using the I-PAC but I’ve ran into a scenario where I need to detect 3 switches (keys) at the same time. Specifically, I need to fire a single event when 3 switches are simultaneously down and fire another event when those same 3 switches released. Any help on accomplishing this would be much appreciated. Found my own answer in the documentation. Ended up with essentially this to make it work. I’m now trying to fire a separate event in between a KeyDown and a KeyUp. So I want to fire an event by holding down ‘v + c + x’ (I have this is working) then have another KeyDown ‘p’ for a separate event. What I’ve noticed is that when I press any key (not just ‘p’) while holding down ‘v + c + x’, the ‘v + c + x’ KeyDown event will fire off as a new KeyDown. Is there any way to keep that from firing but while retaining that the keys are still being held down so that my ‘v + c + x’ KeyUp will fire it’s event when key are released? Any tips would be much appreciated. Worked beautifully. Thank you for the help! Another plea for help here. Everything was working great until I built up a prototype. I overlooked the fact that during real usage the interface (which uses cards along with a slider) will be left with either A S or Q with a KeyDown. Hence, when card is removed or another card is inserted the ‘Z + X + C’ Up/Down only event is not firing – the 4 key combinations still work though. So I can hold A down and switch cards and the ‘Z + X + C + A’ or ‘Z + C + V + A’ event fires as needed but I never see my card specific menu come up or go away which I had firing based off ‘Z + X + C’ only event. Further, I can switch cards and with card inserted use the A S or Q keys and have the desired results – that part actually works great but still no card specific menu. Drawing of setup here with more explanation. Again, any suggestions would be much appreciated.